Holy hell, I totally forgot about this week’s Book of Doom until just now. Talk about a day late and a dollar short. Speaking of short, I thought this week’s choice came up way short. In short, I thought it was terrible. I don’t mean to come off sounding short, but, seriously, it’s a short-sighted venture ala the Sinestro Corps War. 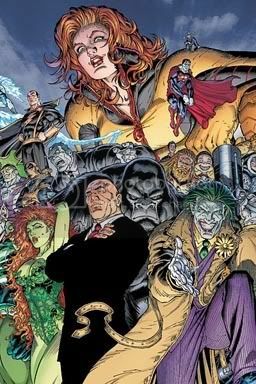 Gather all of the villains who can stop the Justice League, have them sidle up on each League member, get the upper hand, do something menacing, and that’s that. Sound familiar? It’s the formula for the past few years, apparently, and I, for one, am not a fan. Other than that, I have no real opinion, since it’s so early in this new run (which can’t be worse than Brad Meltzer’s pitiful stint), so I guess that I’ll just defer to the Legion members who actually care enough to think about this tripe. I stuck with Brad Meltzer’s Justice League of America for thirteen mind-numbingly boring issues because of his track record with the better-than-average (by a plus) “Identity Crisis” and the awareness that, in spite of his shortcomings, he was attempting “art.” This Dwayne McDuffie run – after two issues – is another beast entirely. In this one issue, the comic players are ambushed by someone who just happens to be standing in the room – not once, not twice, not three times – but SEVEN TIMES. Seriously! I’m honestly not exaggerating! And several of these happen in A HOSPITAL ROOM! Not that you’d know it was a hospital room from Joe Madureira meets Todd McFarlane wannabe Joe Benitez, who managed to evade the ridiculousness of the situation by not drawing backgrounds, thus opting not to detail whatever hospital bed or heart monitor Fatality and Poison Ivy were apparently hiding behind. 1. Batman – you know, the hyper-aware super detective – is throwing a little bat-dart to free Wonder Woman, EXCEPT HE DIDN’T REALIZE THAT THE JOKER, LEX LUTHOR, CHEETAH, GORILLA GRODD AND DR. LIGHT WERE STANDING RIGHT THERE IN THE BAT-DART’S FLIGHT PATH! 2. John Stewart, Red Tornado and Hawkgirl fly into a hospital room through a giant skylight, EXCEPT THEY DIDN’T REALIZE THAT KILLER FROST AND SHADOW THIEF WERE RIGHT THERE! 3. Hawkgirl goes to “cover” John Stewart, EXCEPT SHE DIDN’T REALIZE THAT FATALITY WAS STANDING RIGHT THERE! 4. John Stewart goes to attack Shadow Thief, EXCEPT HE DIDN’T REALIZE THAT POISON IVY WAS STANDING RIGHT THERE! 5. Superman, Vixen and Black Canary go to the warehouse, EXCEPT THEY DIDN’T REALIZE THAT DR. LIGHT, CHEETAH AND GORILLA GRODD WERE STANDING RIGHT THERE! 6. Superman, Vixen and Black Canary think they’ve got the situation under control, EXCEPT THEY DIDN’T REALIZE THAT PARASITE WAS STANDING RIGHT THERE! 7. Cheetah thinks she’s about to kill Black Canary, EXCEPT SHE DIDN’T REALIZE THAT BLACK LIGHTNING WAS STANDING RIGHT THERE! 8. The Warehouse Justice Leaguers think they’ve got the situation under control, EXCEPT THEY DON’T REALIZE THAT LEX LUTHOR IS STANDING RIGHT THERE! Okay, I guess I was wrong – that’s EIGHT TIMES! Those sure are dramatic twists – IF YOU’RE STUPID! This also overlooks the fact that, for the past two issues, the plot has entirely consisted of this: Justice League sub-team A goes to the hospital where Firestorm is; Injustice League members ambush them, overwhelm them, and abduct them. Justice League sub-team B goes to the warehouse where Firestorm was attacked; Injustice League members ambush them, overwhelm them, and abduct them. I wish I was kidding, but it seriously was the exact same thing as what happened in the Justice League wedding special, except with different members! THE EXACT SAME THING! God-diggity-damn this was bad. First they swipe the headquarters from the Saturday morning cartoon, and now they’ve swiped the intellectual level of the plotlines. I’m done with this crap. I hate it so much I made a friggin’ visual aide. I wasn’t planning on buying this issue before we decided it was Book of Doom. I broke down and got the JLA Wedding Special, and while that was fun, it seemed like just another repeat of Justice or any of an infinite number of DC stories in which the bad guys gang up on the good guys. I actually hoped that this issue would take us in a new direction and do more than tell a “Justice set in the JLA Unlimited world” kind of story. Well, that’s exactly what this is. The bad guys work together for… some reason. They gain the upper hand. A big rumble’s in store. Whoop-de-doo. I would recommend this book for any kids looking to get into comics, because it is fun and doesn’t suffer from X-Treme adult elements. The writing, if nothing else, is clever. After the failure of Brad Meltzer’s run on the title, I would’ve said it was time for a 180. That’s pretty much what we have, with an absence of the fractured-narrative-super-dramatic-yawners from Meltzer, but this has all the weight of pillow stuffing. At least the art is original… Oh, wait, no it isn’t. Somehow, the artist manages to derive from both Todd Macfarlane AND Michael Turner in a single issue. I will not be back for thirds. Justice League of America #13 was fun. Was it great? No. Did it have some pretty bad dialogue at times? Absolutely. Was the art hideous? Oh hell yes. But it was still fun. And fun isn’t something we’ve seen in JLA for a very long time. The first arc I read of JLA was “Crisis of Conscience,” which pitted members of the team against each other and led to the dissolution of the team. Good story, but a little angst-y. Next came “A World Without a Justice League,” which did not in fact feature a world without a Justice League, as the League battled the Key for five of the worst issues of any comic I’ve ever read. After a few months off, Brad Meltzer took over the title and gave us seven issues of forming the team, one issue of filler, three issues of a mind-numbing JSA crossover, and two more filler issues. So relative to all that, I’d say “Injustice” isn’t half bad. Apparently I’m the resident Dwayne McDuffie fanboy around here, but there’s a reason for that. Justice League Unlimited was fun. Justice League: Heroes was fun. Beyond! was fun. Post-Civil War Fantastic Four, despite all the crap McDuffie had to deal with, was fun. And so far, his Justice League has been fun. And I’ll take a fun comic over one that tries to be a masterpiece and fails miserably any day of the week. The failure is taking into account the whole Meltzer arc, whereas the first half, in book form, was what I gave a B+. And when I call it a failure, I’m referring also to the fact that his entire arc failed with the bulk of fans. 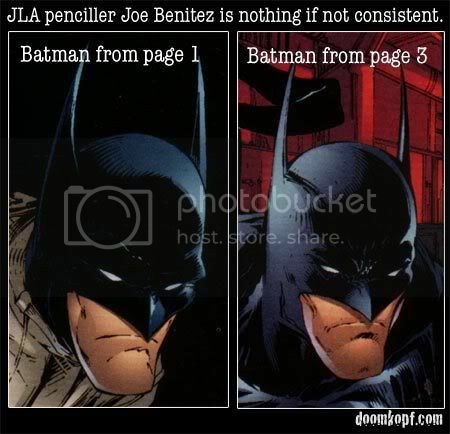 Also, and I swear I’m sick of saying this, I gave the first arc of JLA pretty rough grades when it came out in single issues, but it did read a lot better as a single book. PS – Are you just mad that I forgot to send my review to you? Yes, I am. Thanks for the explanation, though. I was kind of teasing you, since, if you’ll recall, I gave you a hard time about that review when you first wrote it. Maybe not as funny as I thought it was. Oh well. You should add phrases like “you dirty poop face” and it’ll be wayyyy funnier. The real question, though, is which is worse, this or Meltzer’s run? Meltzer’s, hands down. This may be JLA for kids, but that’s better than JLA for Brad Meltzer and no one else. I’ll just copy and paste. Judging by number of issues purchased, this is worse by a score of 2 to 13. I would like to point out that we both used a form of the word “mind-numbing” to describe Meltzer’s run. Meltzer is worse, hands down. Despite nonsensical surprises, there’s been more action (and less self-indulgence) in these 2 issues than even ONE of Meltzer’s. This is a purely objective quantification that has been proven by science. Do you guys like playing with Jack-in-the-boxes? Do you like playing with wads of dog feces?